Meet versatile musician, Pat Melanson, who started a business called The Piper’s Guild. From his home in Shelburne, Melanson’s created a very special network. Anyone in the province who wants a pipe for a wedding, funeral, convention, 60th birthday bash – whatever – no problem! The former school teacher has a system set up where you can hire a piper for any occasion, any time of year. 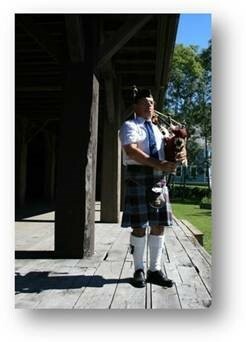 The Piper’s Guild is about making quality performers available to the widest possible market, in a format that allows both performer and customer to get the best use of their time and money. Melanson accomplished this by creating personnel networks across the province. This makes it possible for clients to hire musicians and performers (not only pipers) close to where the event is taking place, which in turn helps reduce costs. Melanson’s biggest challenge is to think like a business person instead of a musician. “I am the boss and founder, and if I don’t do it, neither will anyone else.” But that’s the price of being in business and it’s offset by the perks. Money is starting to flow. His reputation is starting to build. Customers are happy. “The have paid for quality and they’ve got it. It is just immensely satisfying to know that what you’ve created is the right tool for the right job,” says the 49-year-old. Pipe majors and band managers in particular seem to grasp the concept immediately and want in on the action. They know and understand how frustrating it can be to successfully market a product. Through the Guild, this is all done for them and they reap a financial benefit to boot. So it’s a win-win situation for everyone.